Another brilliant variation of my super popular low carb pie recipe: Ham and Cheese pie. Again, super yummy and super easy to make; filling this time is basically diced ham, cheese, and oregano! You can watch the video above to learn how to make it, step-by-step, or simply follow the directions below. In a bowl mix together eggs, tahini, salt, and baking powder. Line a parchment paper on a cake tin and pour half of this batter in. I’m using a 24 cm square tin. Then make a layer of ham, followed by mozzarella cheese, finishing with a layer of the remaining batter. 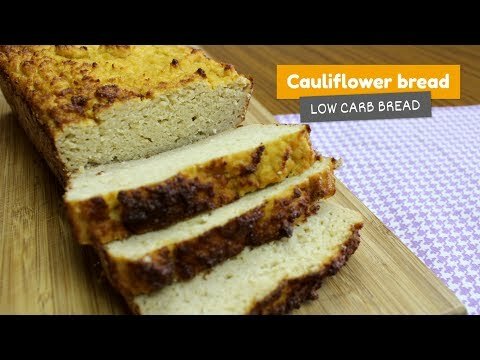 Would like to see more low carb pie recipes? Ah, as you may have noticed, I used tahini for the main recipe, which gives you a nut-free result. Who doesn’t like the convenience of a flourless recipe? Even more, if this cake is a healthy option right? This Flourless Chocolate and Banana Bread recipe is ridiculously simple and still incredibly delicious. Another quick note, I used tahini for a nut-free version, but this cake is equally delicious made with almond or peanut butter! Add tahini, eggs, bananas, cocoa powder, baking powder, and salt to a blender and pulse until smooth and creamy. Grease a cake pan with coconut oil and cover it with a baking sheet. I used a 20cm loaf pan here. Now, add in the batter to the pan. Depending on your oven, it might take more or less to be ready. The right moment is when a toothpick inserted in the centre of the bread comes out clean. These Peanut Butter Cookies are a great option for a snack, kids lunch box, or even an on-the-run breakfast. Can’t deal specifically with peanuts? This recipe works perfectly with any other nut butter. I’ve tried with almond and cashew nut butter (the latter is dangerously delicious though, lol). Another cool thing about this healthy cookie recipe is that you can easily spread the dough with a rolling pin and use your cookie cutters! Add all ingredients into a large bowl and gently work them together using your hands until you have a nice ball of dough. This dough is very easy to work with, you can either roll it out, finishing cookie cutters or just shape them into balls like I did here. Place cookies on a baking tray covered with parchment paper. Let them cool down completely before removing from the tray. Now enjoy your peanut butter cookies! Banana bread has a special place in my heart. Why? Well, it’s simple, it’s not every day that you find something that is the perfect combination of bread and cake, right? I ❤ it toasted and served with butter on a lazy Sunday morning. This time I decided to level it up by adding walnuts and dark chocolate chips. Next, add the coconut flour, baking powder, psyllium husks, cinnamon, and salt. Mix just enough to incorporate all ingredients. Finally, add bananas, chocolate chips, walnuts, and stir gently using a spoon. Grease a cake pan with coconut oil and cover it with a baking sheet. We used a 20cm loaf pan here. Then, add in the batter. Insert a toothpick into the centre of the cake and it should come out clean. Enjoy your banana bread with chocolate chips! Tip: trying to reduce your daily intake of carbs? You can make a version that is even lower in carbs by replacing honey with an artificial sweetener of your choice. Looking for another cakes recipes? Just check my healthy cakes page full of yummy options! This low carb pie recipe is my favourite; So easy to make! I’ve been using the same batter and just creating a different filling to bring some variety to the table. Definitely a winner! So for today’s video I created a delicious chicken and cream cheese pie. With a super creamy and tasty filling. Yum, Yum, Yum! Next, in a bowl mix together eggs, tahini, salt, and baking powder. Line a parchment paper on a cake tin and pour half of this batter in. I’m using a 24 cm square tin. Then make a layer of that chicken filling, followed by a final layer of the remaining batter. Enjoy your chicken and cream cheese pie! Not a huge fan of chicken? No worries! Check the low carb pie variations and ideas I created using this same batter!